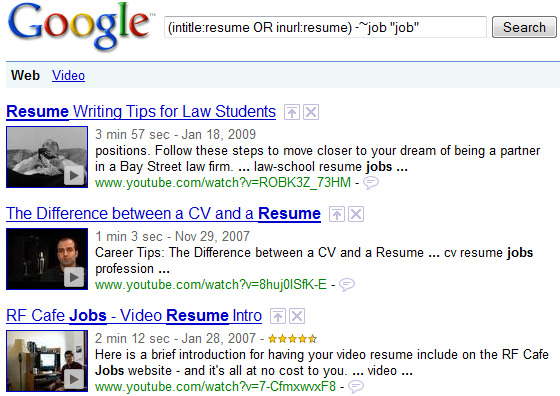 This post is second in a series focused on using Google to search for resumes on the Internet. Whether or not you had those questions burning in your mind, I will address them all in this post. I’ve read my fair share of recruiting blogs and online discussions between recruiters and sourcers. As such, I encounter quite a bit of advice regarding tips and tricks to use when searching for resumes on the Internet using Google. Some of the suggestions I see make sense at first, but being the inquisitive guy that I am, I don’t just take the suggestions and run with them, assuming they accomplish what they seem to accomplish. I take the time to test search tips, tricks, and suggestions to make sure they add value to my search efforts and that they do EXACTLY what they claim to do. 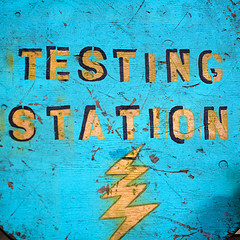 Today, you get to benefit from some of these tests, as I am going to challenge some of the suggestions I’ve come across over the years when it comes to searching for resumes on the Internet using Google. Let’s get going, shall we? I’ve seen some sourcers and recruiters suggest coupling the tilde ~ symbol with the word “job” in an attempt to eliminate results with the words “job” and “jobs,” instead of using both -job and -jobs, as I recommend. Click here for the results. 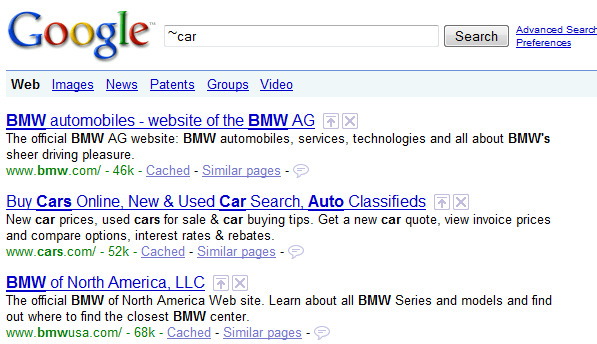 475,000 results at the time of the search. If Google actually interpreted -~job as both -job and -jobs, we shouldn’t get ANY results, let alone nearly half a million, because the search is written to actually look for a word we are trying to eliminate. I hope you can appreciate how strange those results actually are. Confused by the results? Me too! It actually takes using Google’s “exactly as is” search symbol, the plus + sign to finally see that at least using -~job will in fact eliminate the word “job” from search results. What this testing demonstrates is that trying to eliminate the 2 words “job” and “jobs” from being returned in search results by using -~jobs DOES NOT WORK. It appears that the tilde operator on Google does not in fact also search for and return (or eliminate) words with alternate endings, such as plural words. For the word “car,” yes, but not when it comes to the word job. As such, it’s safer to simply write out -job -jobs. I’ve heard some people suggest coupling the tilde with the word resume, in order to find results that have words synonymous with the word “resume,” such as CV or Curriculum Vitae in their url or the title of web results. Click here for the results. 294 results at the time of the search. Click here for the results. 2760 at the time of the search. Wow! 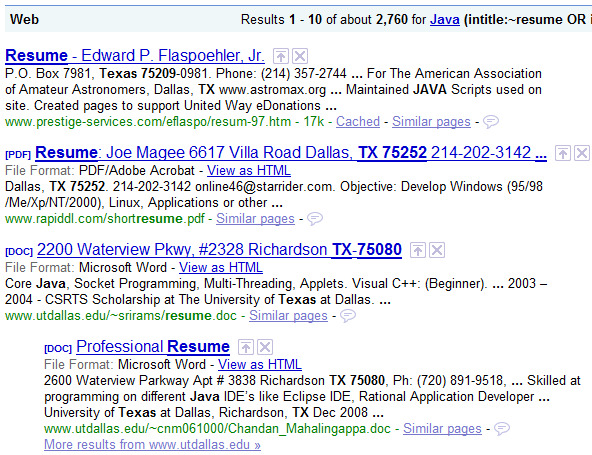 2760 results when we used the tilde vs 294 without the tilde – seems like a no-brainer to always throw in the tilde when searching for resumes, right? Click here to see the search results page. Some pretty ugly results, right? So where are the 2400 extra resumes we were expecting to get? Keep searching past the 300 mark and you will see tons of junk results. That’s why I can’t in good conscience recommend using the tidle ~ in conjunction with the word “resume” when searching for resumes. Where are the CV’s Anyway? Click here for the results. 82 results at the time of the search. But when I have searched for CV’s, I have noticed that many people who save their resumes online who use the term CV are in school, are educators at a university, or are international (non-US) folks, whom you may or may not be able to engage depeding on your location and need. 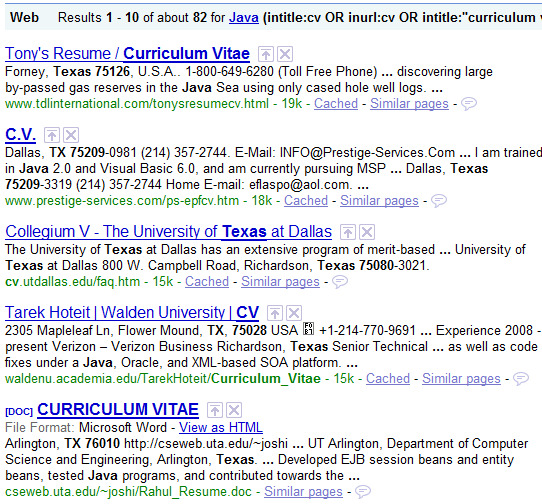 Did you notice that 4 out of the 5 results from the last screenshot have .edu in the url? That means they are from university sites, and I have found many of these .edu CV’s to be of people with no paid work experience – which depending on your hiring needs, you may not be able to hire. When it comes to your search terms, Google claims that they will look for some word variants automatically, such as words with alternate endings or pluralization. For example, if you are trying to eliminate false positive results of the word “jobs” when searching for resumes, using -job does not eliminate results with the word “jobs,” although if Google were in fact truly auto-stemming the word job, we could assume it should. So once again I have to recommend simply spelling out -job -jobs when trying to eliminate job-related false positive results, because Google does not auto-stem -job to also include -jobs. I’ve heard some sourcers and recruiters say that it is unecessary to search for the word “resume” specifically in titles and URLs, through the use of (inurl:resume OR intitle:resume). This is because simply searching for the word “resume” should return results with the word “resume” in the body of the website/page as well as in the url and title. Click here for the results. About 1400 at the time of the search. 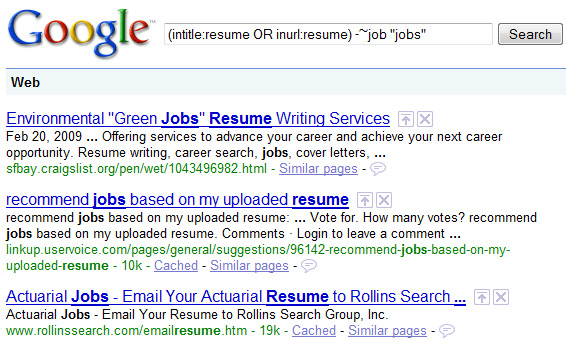 You can see that the word “resume” is in fact highlighted in the blue title and green url lines, as well as in the “body” of the search results. If you remember, the search I used previously that did specifically target (inurl:resume OR intitle:resume) only returned 294 results. 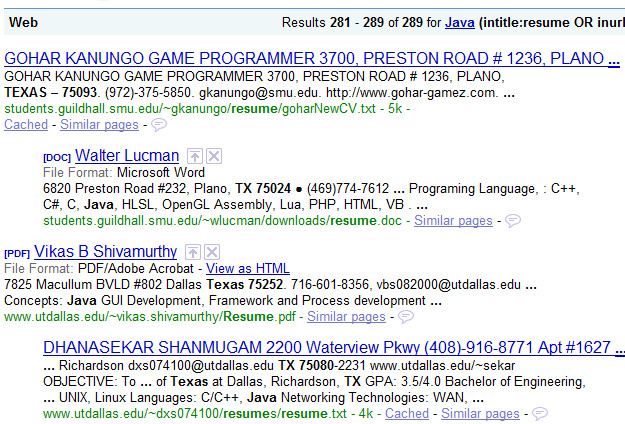 When I searched for “resume” without specifying that the word had to be in either the url or title, I got 1390 results. However, let’s not get too excited about the “extra” 1100 results we get from just searching for the word “resume” and not limiting the search to only results mentioning “resume” in the url and/or title. Let’s take a look at the results past #300 to see what we’re really getting: Click here for the results. Umm…those aren’t resumes – those are false positives! Don’t ever be impressed by large quantities of results until you check in the “deep” end and make sure that they are just as high quality as the first few pages. 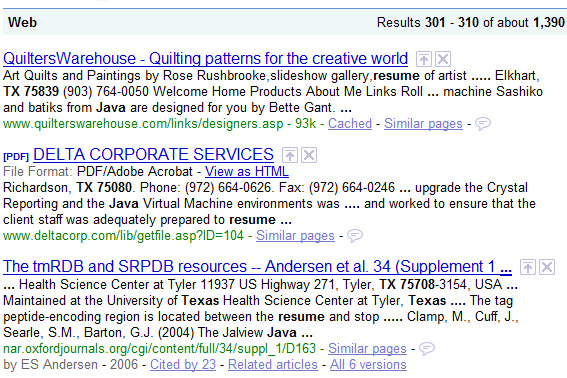 This test has shown that simply searching for the word “resume” anywhere and not forcing Google to specifically target results that mention the word “resume” in the title and/or url of results does not in fact yield more high quality results. What it does is get you more junk in most cases. Yep – resumes all the way to the last page. The last assumption I will challenge is that it’s always a good idea to search for specific file types when searching for resumes on the Internet. All of the results are PDF files. While searching for specific filetypes can be handy, there are many filetypes available to people when saving their resume online. Back in 2007, I read Jim Stroud’s Resume Sourcing Survey and it was an eye-opener – there are so many different filetypes people use when creating and saving resumes online. While you may think you are uncovering a lot of resumes when searching for doc, html, php and pdf fileytpes, you’re probably not searching for ASP, XML, PID, PHTML, MHT, DOT, CGI, XSL, WPD, and SDW filetypes. 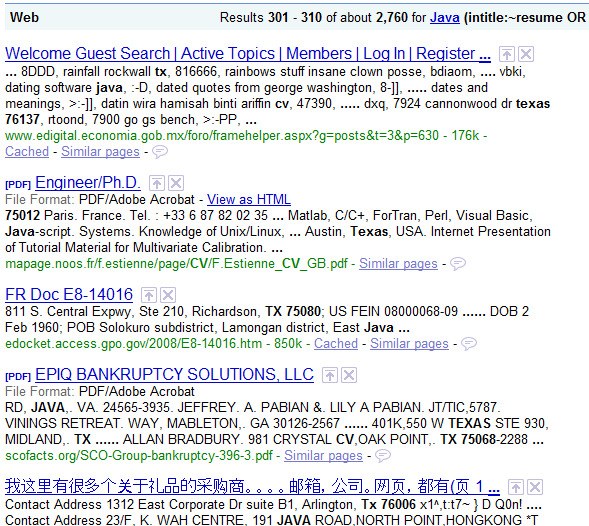 I am not exactly sure why some people suggest searching for specific filetypes when searching for resumes. If I had to guess, I would say it has something to do with trying to get rid of false positive non-resume results. Perhaps the thought process is that job postings and such are not typically DOC or PDF files? 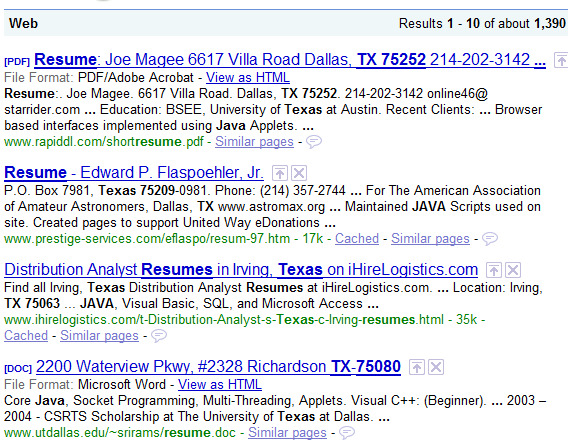 In any event, searching for specific filetypes is unnecessary, because when you use a search string that doesn’t specify filestypes such as this one: Java (intitle:~resume OR inurl:~resume) -job -jobs -sample -samples -“resume service” 75001..76155 (TX OR Texas) …you’ll get every resume result available, REGARDLESS OF FILETYPE. You can see from the results below that it returns ALL results, regardless of filetype. 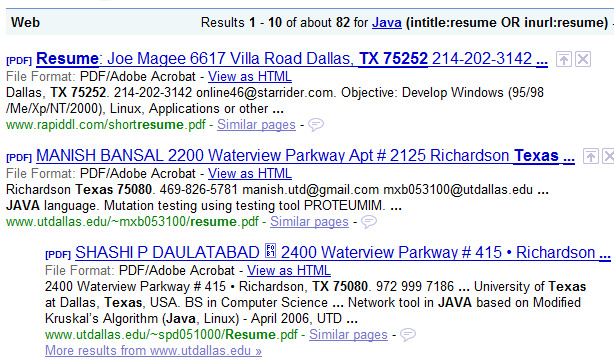 In the screenshot, you can see we snagged 4 different filetypes from the first 4 results: HTM, PDF, DOC, and HTML. That’s why I don’t recommend targeting specific filetypes – because if you do, unless you actually search for every possible filetype available, you will be missing results. 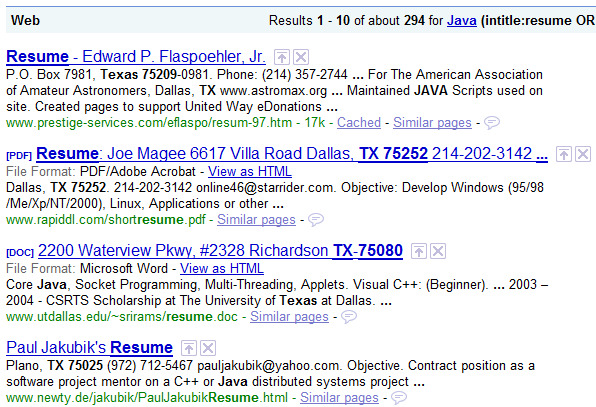 There has been much written on using Google Custom Search Engines to find resumes on the Internet. Creating your own and using others’ Google CSE’s can be a convenient way of automatically building in core and essential search logic (title/url search, false positive term removal, etc.) so that you don’t have to keep entering it into your searches. However, when it comes to using someone else’s CSE, I’d advise that you not blindly use it without adapting it to your specific use. Only you know what it is you are looking for specifically, where you would like to get your results from, and the specific locations you would like to recruit from. I believe the best CSE’s are those that have location-specific logic built in, so that all you need to enter is your keywords and nothing else. Implicitly trusting that someone else’s custom search engine has the optimum search logic would be a mistake. Use CSE’s designed by others as a starting point to modify and create your own that suits your specific need. I hope you enjoyed me walking you through testing some of the more common Google resume search suggestions I’ve come across over the years. It can be both easy and dangerous to follow search advice from anyone, regardless of their experience or reputation, and take their suggestions and immediately begin putting them to use. I strongly recommend that you take the time to thoroughly test any sourcing/recruiting advice you read or hear about before making the assumption that it works as intended and that can help you achieve your goals. As I’ve shown you today – some suggestions such as searching for specific filetypes can actually prevent you from finding all of the resumes available online, and others such as searching for ~resume can yield more junk than viable results.